Diabetes is a chronic disease that occurs when the pancreas either does not produce enough insulin or when the body cannot effectively use the insulin it produces. It is one of the fastest spreading diseases worldwide. Due to the disease spreading at such a high rate, people have started fearing it a lot more and fear always gives birth to myths. 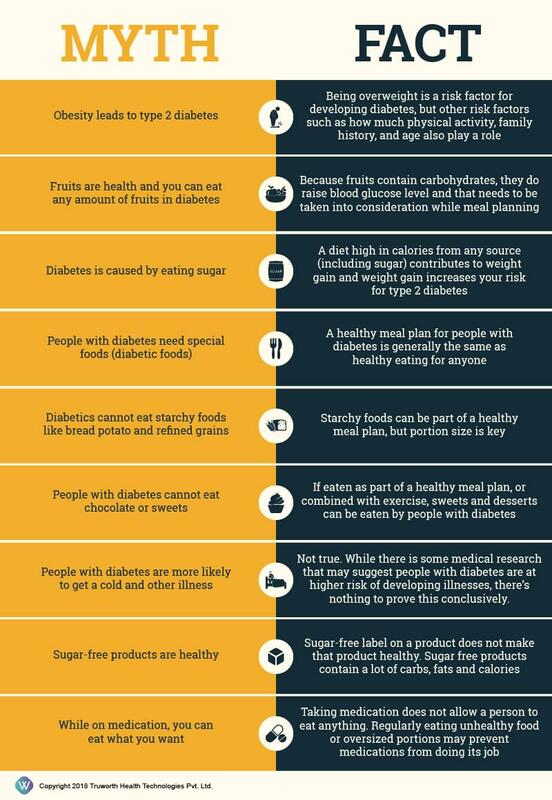 There are many myths about diabetes which can make separating fact from fiction difficult. To cut through the confusion, we’ve broken down some of the common misconceptions. Q: Why is it OK to eat fruit when it’s full of carbohydrate? Are some fruits better to eat than others? The calories in all fruits are mainly carbohydrates with a bit of protein. We need to eat a certain amount of carbohydrates every day for energy. Healthy sources of carbohydrates include fruits, vegetables, legumes, and low fat dairy foods. Q: Will Insulin make me gain weight? Insulin helps balance blood glucose levels. It does not have to cause weight gain. To prevent weight gain, Practice portion control, burn extra calories with exercise. Q: Why is weight loss so important? What’s the best way for a person with type 2 to lose weight? Weight loss increases insulin’s sensitivity. It helps the cells to use the insulin more effectively than earlier. It helps to improve blood sugar, cholesterol level and possibly taking fewer medications and lower doses. Yes, adults with diabetes can drink up to 2 drinks per day. People who take insulin or any other blood glucose lowering medication that can cause hypoglycemia, should eat some food when drinking alcohol. Q: What foods should I eat before and after exercising? Foods like high fiber carbohydrates (30gm), they are quick and easy to digest for energy, (5-10gm) healthy fats, 2 servings of non-starchy vegetables. During workout body uses insulin more efficiently which will lead to hypoglycemia. To counter it, reach for a snack which should contain carbohydrates and protein. Q: I have just been recently diagnosed with Diabetes, what should I do? You can live a long and healthy life by eating healthy, being physically active and taking medications to keep your blood glucose in your target range. Q: I have diabetes. What should be my target blood glucose level be? Keeping blood sugar in target will lower the risk of developing complications of diabetes. Target level depends on the person and their situation. Normal range should be 80-130mg/dl, PP- 80-180mg/dl. Q: How should hypoglycemia be treated? Each person may have different symptoms. Learn to recognize yours. Being overweight can keep the body from producing and utilizing insulin properly. It can also cause high blood pressure. Hypoglycemia occurs when their bodies don’t have enough sugar to use as energy. Q: Does eating a lot of sugar cause Diabetes? Eating a lot of sugar does not directly cause diabetes, but it can lead to weight gain. Being overweight is one of the risk factors that can cause Type2 Diabetes. Q: Why low fat diet? High fat foods increase insulin resistance. Following a low fat diet not only helps improve insulin’s action but will also help reduce blood sugar. Q: How much fat is allowed? By avoiding animal products and added oils you will be able to keep your total fat intake around 20gms per day. Q: How much physical activity do I have to do? Physical activity is a great way to help manage diabetes. Minimum 30 minutes of walking and some cardio. Increase up to 10,000 steps a day.